Professional high quality Fronius welding equipment is the choice for many welders. More expensive than most makes but the company develop products the highest specification. 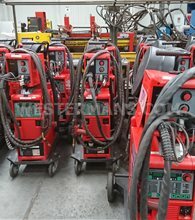 We stock a wide range of refurbished used Fronius Welders at affordable prices including TIG, MIG, Synergic MIG and cladding systems. 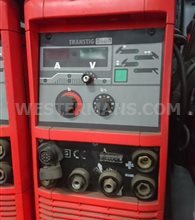 Fronius Welding Equipment Miscellaneous Items - Do you Need Spares or Repairs? For over 70 years the name Fronius has stood for intensive research and the constant search for new, innovative solutions. The perfect efficiency of every product has repeatedly been awarded both national and international prizes. 10th June 1945 The firm is established by Günter Fronius in Pettenbach, Austria and commences production of battery chargers and welding transformers. In the 1950's Welding Technology launch of Fronius' first welding transformer with magnetic yoke-type regulation, permitting continuous adjustment of the welding current. 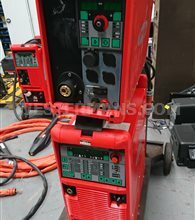 These Austrian made Fronius welding machines are really for the hi-tech professional welder. The technology and research of Fronius is one of the best in the world. Often they are out of the price range for the average welding fab shop. 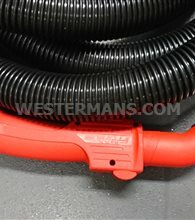 Westermans can offer a solution so that you can afford this technology. 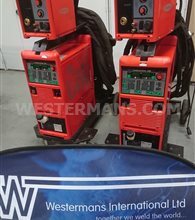 Selling Used and Refurbished Fronius machines means you can have a great welder or automated system at a fraction of the cost of new. In industry-typical system applications, Fronius´ decades of experience in the field of welding automation give it a head-start: Take any industry-typical intem that needs welding - be it shock absorbers in vehicle manufacturing, or boring-heads in the offshore sector - and these ready-developed systems will deliver instant efficiency in many different sectors. Everything rotating and in motion - except for one thing, and that´s the weldment itself. The perfect combination of control unit, power source and weldhead offers reproducible quality and cost-effective production. Whether you are using MIG/MAG, TIG or electrode processes - whether your operation is automated or manual: Fronius power sources are in a class of their own. Each system has been developed and produced by Fronius using state-of-the-art technology. The plasma process is basically very similar to the TIG process but has a number of critical advantages. These make it an interesting alternative to laser welding where tough quality demands have to be met, especially on sheets and other components with a sheet thickness of up to 8 mm (0.31 in. ).In plasma welding, the arc is constricted by a cooled gas nozzle. The powerfully bunched arc that results does away with the need for time-consuming weld preparation work such as V- or U-type joint preparation. This saves as much as 30 % of the fi ller metal. In turn, the higher welding speed – around 20 % faster in soft-plasma welding, for example – saves time and costs at the same time as ensuring deeper penetration. Also, being enveloped in plasma gas, the tungsten electrode has a much longer service life. Why not visit the Fronius web site and use the Fronius Virtual Lab to look at welding technologies, articles and useful information. 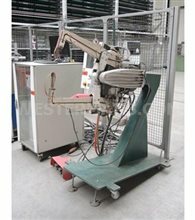 Overview: A special machine for a special material. Aluminium is the material used in many branches of industry. During welding, its pronounced thermal conductivity and its oxide layer repeatedly lead to problems that impair the quality of the seam. Fronius were quick to notice these difficulties - and to develop appropriate solutions. The result is that we can now unveil the first-ever power source to be "tailor-made" for aluminium applications. Overview: CMT. Three letters which revolutionised automatic welding. The extreme benefits of this breakthrough technology are now easily accessible with a manual system. 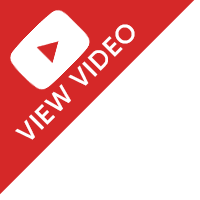 Overview: Stainless Steel - a demanding material requiring gentle welding, which – like aluminium – the experienced welder will only “handle with kid gloves”. And this is just what the TransPulsSynergic 2700 CrNi now provide a technical solution for: Pre-programmed characteristics, welding programs that are “fine-tuned” to stainless materials, PT-Drive push-pull-torch, with digitally controllable planetary drive, etc. 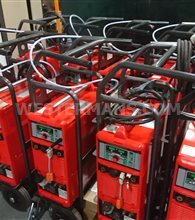 Overview: The Fronius welding / brazing package is used extensively with all the major manufacturers throughout the world and is regarded as the specialists’ choice. Overview: The Revolution just keeps on going: Fronius has added yet another highlight to its trailblazing series of digitally controlled power sources – the new TransPulsSynergic 3200. With it, the 270 to 400 A range now also has its own optimally powerful and economical digital system. 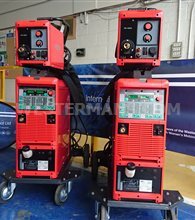 Its multiprocess capabilities make it suitable for MIG/MAG, TIG, MMA and even robot welding. The principal area of use is for welding thin and medium thicknesses of material, and for welding root passes on joints with thicker cross-sections.